This past Monday, the Notre Dame Cathedral in Paris appeared to burn down. Early reports were that the 850 year old edifice was a total loss. Nothing had survived. 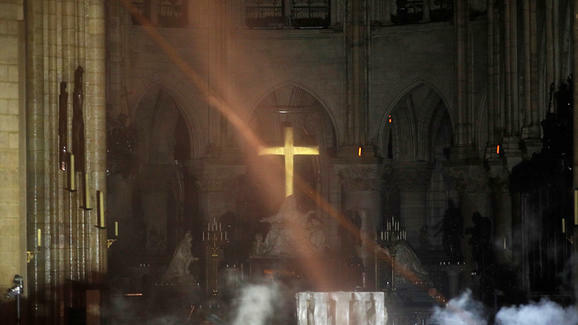 But when the smoke cleared, the world saw the image of a cross, a golden cross that appeared to glow near the Cathedral’s altar – surrounded by ashes and rubble and destruction and chaos – the cross became a stark and serene reminder of the Christian faith itself. As it turns out, much of the Cathedral was preserved from the ravages of the flames. The fire in the cathedral was shocking to us, because such things don’t happen in our enlightened age. We live in a world of safety, of regulations, of sprinklers and fire extinguishers, of inspections and experts. We put our trust in princes to make sure that bad things never happen to us. We especially protect children not only from harm and danger, but also from scraped knees and the hurt feelings of not receiving a trophy. We are a society that believes in being in full control. Our world has become hermetically-sealed, even as we sanitize death itself, keeping it behind the closed doors of the butcher shop and the hospital. And whereas earlier generations of teenagers stormed the beaches at Normandy, our current generation of young people are scrupulously protected even from disagreeable opinions. Sometimes a Nine Eleven or a Notre Dame Fire puts things into perspective. Dear friends, we live in a broken world, a world of sin and death, of malice and violence, of so-called natural disasters and things that we cannot control. We Christians bear the cross of this fallen world, of our corrupted flesh, but we bear our crosses even as we follow Jesus, who willingly carried His own cross to Golgotha. Jesus did not come into our world to make us kinder people, but to make us perfect people. Jesus did not come into our world to lay down the law, but to fulfill the law. Jesus did not come into our world to give us our best life now, but to call us to die to sin and rise to newness of life for eternity – to bring Christ crucified to our world of Nine-Elevens and Notre Dame Fires and butcher shops and hospitals. By His atoning death, we are indeed healed, forgiven, made new, restored, and brought through the flames of this world and even spared the fires of hell, to shine burnished in the light of the countenance of our Lord, all by grace, all through faith. For His crucifixion is the suffering and death that we have deserved, dear brothers and sisters, the sacrifice of the “Lamb… led to the slaughter,” so that He might take our place, the punishment that we have earned. For Jesus, the cross is a symbol of death, but for us, dear friends, it is a symbol of life. Too often we treat the cross like a fashion statement or an emoji – but the cross is more than just a symbol that glints in the light to give us hope: the cross is the flesh-and-blood means by which our Lord Jesus Christ died in our place, so that we might survive the flames of the end of the world, when everything will be consumed with fire: cathedrals and continents, crosses and Caesars – nothing will be left of this fallen and passing world, dear friends, nothing but the Word of God, that endures forever. And from the destruction of the wrath of God, we will rise unscathed, for we are not under judgment, dear friends, because we are under the cross. And under the cross, we are safe, we are forgiven, we are recast in the burnished gold of our true humanity as we were created to be, being purged from the dross of sin and corruption, purged by His passion, purged by our Lord’s suffering, purged by His atoning death. Today, dear friends, we focus on the cross, we focus on our Lord’s substitutionary death, we focus on the blood of the Lamb. We mourn on account of our sins and the Lord’s suffering even as we mourn the appalling destruction of the Cathedral. But we look to the cross, and to where the cross leads: to a brighter future, to the resurrection, to the rebuilding, to the life that has no end, to the hope shining from the face of the Light of the world: the Light no darkness can overcome. There is no more enduring symbol of the Christian faith than the cross, dear friends. The cross is why our Lord took flesh, and the cross is where our Lord sacrifices His flesh. The golden cross that glows on our own altar is a reminder of the true flesh and blood that the Lord distributes to us in His holy sacrament of the altar: a participation in His death, a communion in His resurrection, and the promise of His coming again in glory. Our Lord’s cross, and the crosses on Christian altars around the world, are surrounded by ashes and rubble and destruction and chaos. And yet, everywhere that the Gospel is proclaimed and the sacraments are administered, dear brothers and sisters, the cross is a stark and serene reminder of the Christian faith itself – faith in our Lord Jesus Christ, who “bore the sin of many, and makes intercession for the transgressors” – even unto our eternal life. Amen. Note: This sermon was not preached because of inclement weather. Of course, these are things that Jesus never says. There is truth. Truth exists outside of us. Jesus is the Truth. Words are important. Words are the means by which God creates the universe, and remakes you from sinner to saint. Jesus is the Word. Doctrine is not up for grabs. For doctrine simply means what we teach. There is true doctrine and false doctrine. False doctrine is deadly. Correct doctrine is taught by a correct teacher. And Jesus is our Teacher. Jesus says that the bread is His body. We are to eat it. We are to do it in His remembrance. Jesus says the wine is the new covenant in His blood. We are to drink it, and we are to do so in His remembrance. And when we do this as He instructed us to do it, we are proclaiming His death: we are telling the truth, we are spreading the word of the Word Made Flesh, and we are teaching correctly – teaching our children, ourselves, our neighbors, and the world. We are confessing the truth of what our Lord is calling us to do. We are telling the truth about Him: the truth about the Truth. The Lord calls us to “do this” as He established on that first Maundy Thursday. In fact, our Lord incorporated a New Commandment into this Eucharistic meal: that we Christians love one another – by our deeds as well as our words. When we serve our fellow believers, and when we are served with the body and blood of Christ, we are proclaiming the Lord’s service to us: His death, His resurrection, His coming again. We are teaching the world that Christ has come in love, to forgive, to renew, to restore, and He is truly coming again to re-create the heavens and the earth – even as He recreates bread to be His body and wine to be His blood by means of His miraculous and powerful word: the word of the Word. The words of the Word Made Flesh created the universe, healed the sick, gave sight to the blind, restored hearing to the deaf, and made the lame to walk. The Word of God forgives our sins, declares our innocence, and restores our communion with the Father. The Word turns water into wine, bread into His body, and wine into His blood. And this, dear friends, is why we do not believe that our Lord just meant to establish a meal of mere bread and wine that reminds us of His advent. Rather, we believe that this Holy Eucharist is an ongoing advent, that He is truly present with us every single time that we “do this” in His remembrance. The blood of the Lamb had the actual power to ward off death itself. It was not symbolic. It was not merely a ritual. The life was in the blood, and the blood was the covenant, the promise of God. And misuse of the Lord’s Word, despising the blood of the Lamb, could well result in death. It certainly meant death to the unbelievers who chose to worship Pharaoh instead of the One True God. And so we remember on this Maundy Thursday. We remember our exit from Pharaoh’s tyranny. And we remember our exit from Satan’s tyranny – by means of the covenant, by means of the Lamb’s sacrifice, by His flesh, by His blood, by His Word, and by His new commandment that we love one another. For when we do as the Lord instructs, when we serve one another in our needs and in our hunger and thirst for righteousness, when we “do this” in remembrance of Him, when we eat and drink, then truly we proclaim the Lord’s death until He comes – we confess the truth that Jesus is God in the flesh who has come to redeem us, and we teach the world who Jesus is, and what He came to do. And so, dear friends, let us examine ourselves. Let us confess our sins and rejoice in our pardon. And let us discern the body of the Lord, taking to heart His mighty and creative words: “This is.” Let us worship Him, even as those under the first covenant gazed upon His divine presence in visible form, physically manifest in the Ark of the Covenant, being miraculously present upon the Mercy Seat. Let us not shy away from what the Lord’s words mean, but rather let us confess them and teach them; let us practice them, and most important of all, let us believe them! “For as often as you eat this bread and drink this cup, you proclaim the Lord’s death until He comes.” Amen. Beginning with the 1961 edition of George Orwell's iconic novel 1984, the Afterward is an essay by the German Social Scientist and Philosopher Dr. Erich Fromm (1900-1980). Of course, Fromm's analysis is temporally pegged to the time at which he wrote (1961). This was a time when the entire world was obsessed with the Cold War, the Arms Race, and the seeming inevitability of an imminent World War Three and the destruction of life on the planet as we know it. This prevailing spirit of the postwar age dominates literary interpretation of that era, and understandably so. This was the year of the construction of the Berlin Wall, and the year before the Cuban Missile Crisis. But the fact that history took a different trajectory than the "inevitable" nuclear war between the USSR and the USA exposes some of the blind spots of writers of that time - including Fromm. His Afterward betrays his Socialist and anti-capitalist bias and sense of the "big corporation" as the real contemporary Big Brother, with no input of the State (other than its involvement in the promotion of the Arms Race). Thus much of the societal and governmental and philosophical warnings of Orwell are drowned out by Fromm's overbearing fear of thermonuclear war. Another important aspect is Orwell's description of the nature of truth, which on the surface is a picture of Stalin's treatment of truth, especially in the thirties. But anyone who sees in Orwell's description only another denunciation of Stalinism is missing an essential element of Orwell's analysis. He is actually talking about a development which is taking place in the western industrial countries also, only at a slower pace than it is taking place in Russia and China. The basic question which Orwell raises is whether there is any such thing as "truth." "Reality," so the ruling party holds, "is not external. Reality exists in the human mind and nowhere else ... whatever the Party holds to be truth is truth." If this is so, then by controlling men's minds, the Party controls truth. In a dramatic conversation between the protagonist of the Party and the beaten rebel, a conversation which is a worthy analogy to Dostoyevsky's conversation between the Inquisitor and Jesus, the basic principles of the Party are explained. In contrast to the Inquisitor, however, the leaders of the Party do not even pretend that their system is intended to make man happier, because men, being frail and cowardly creatures, want to escape freedom and are unable to face the truth. The leaders are aware of, the fact that they themselves have only one aim, and that is power. To them "power is not a means; it is an end. And power means the capacity to inflict unlimited pain and suffering to another human being" [Cf. this definition of power in Erich Fromm, Escape from Freedom. New York: Rinehart & Co., Inc., 1941. Also Simone Weil's definition that power is the capacity to transform a living person into a corpse, that is to say, into a thing]. Power, then, for them creates reality, it creates truth. The idea that truth is subjective and malleable, that reality is a state of mind, and that control of the prevailing narrative is the epitome of power: power to create truth - has germinated and blossomed in the form of Postmodernism. Postmodernism has made the transition from an arcane and eccentric literary theory to the dominant philosophy of our time. And Postmodernism led to the current "Social Justice" malaise and the rise of totalitarian "Intersectionality", following Orwell's trajectory about the control of language - known to us today as "Political Correctness" and expressed by Orwell as "Newspeak." For a fast forward from Fromm's 1961 to 1984 as it truly exists in the present, I would recommend Dr. Michael Rectenwald's 2018 book Springtime for Snowflakes: 'Social Justice' and Its Postmodern Parentage. Springtime is both a quick primer on Postmodernism (and its related literary theories) and how it led directly to the SJW "snowflake" culture that dominates the university, as well as how its Orwellian stranglehold on modern thought manifested itself in his own life and academic career as an actual Orwellian dystopia. Dr. Fromm's Afterward is hit and miss - which is easy for me to say with nearly sixty years of hindsight that includes the rise of Postmodernism; the Fall of the Berlin Wall and the Soviet Union; the Socialist decimation of Zimbabwe and Venezuela; and the increasing cultural stranglehold of conformity, social and political language-policing, and the rise of Social Media in the enforcement of the Orwellian control of truth as a subjective and malleable tool in the hands of a powered elite rather than a transcendent and objective ideal of the human mind. I once heard a non-Christian refer to our faith as a “blood religion.” He meant it to be provocative and insulting. But similar to Caiphas stating that it is “better for one man [Jesus] to die for the nation” than for everyone to perish, there is an unintended and ironical truth being told. Yes, Christianity is a blood religion. When God fashioned the first man Adam, He made him of dust, and fashioned flesh and bones and blood, and breathed life into him. He made Adam in His own image, and then fashioned Eve of Adam’s flesh and blood. Adam, in the image of Christ, was a flesh and blood man. And when Adam and Eve sinned, when the Lord’s warning that they would “surely die” came true, their blood would be required of them. For the life is in the blood. But even then, the Lord, in His mercy, saved them from eternal death by means of blood, innocent blood, the blood of a substitute, animal skins of the first sacrifice which covered their nakedness and their shame. And sadly, when mankind had multiplied from two to four, Cain shed the blood of his brother Abel, whose blood cried out to God. And as the world became more violent and bloody, the Lord sent the great flood, in which the blood of nearly every living creature was shed, blood mixed with water, as a cleansing of sin. But Noah and his family were saved by the water, and at the end of their time on the ark, they renewed the practice of the blood sacrifice unto the Lord. When Abraham obediently consented to sacrifice his son, his only son, the Lord provided the substitutionary sacrifice, the “ram, caught in a thicket by his horns” whose blood was shed instead of his son Isaac’s. And Abraham noted that the Lord provided. When the children of Israel left Egypt, the blood of the Passover Lamb protected them from the angel of death, and they too were saved through water at the Red Sea, where the blood of Pharaoh’s army mixed with the water of the sea called Red. And Moses received the Law from God, which required blood as the price of sin: an eye for an eye, a tooth for a tooth, a life for a life – along with the sacrifices of animals offered up to God for the forgiveness of sins. The people of God continued to obey the Lord’s command of blood sacrifices at altars: at the tabernacle, and then at the temple. But “it is impossible for the blood of bulls and goats to take away sins,” says the author of Hebrews. For those sacrifices were tokens of the one sacrifice to end all sacrifices, the pinnacle of human history that proves indeed that Christianity is a “blood religion”: the bloody altar of the cross! As St. Paul confesses: “We preach Christ crucified.” Our salvation is from the blood of the Lamb of God that takest away the sin of the world. The Lord’s blood, the blood of which Pilate himself asserted his own innocence, the blood that “all the people answered, ‘His blood be on us and on our children!’” – this holy, precious blood that offers redemption to all of mankind and atones for all of the sins of the world, was poured out as a sacrifice during His passion, at His flogging, during the beatings that He endured, and in the horrific hours of His crucifixion. And when the Lord’s ordeal was finished, that is, when He had victoriously completed His mission of love for us, dear friends, He “yielded up His spirit.” As the lifeblood of the Lamb, the Sacrifice to end all sacrifices, ebbed from His holy body, “behold, the curtain of the temple,” that place of priests and victims and sacrifices, “was torn in two.” “And the earth shook, and the rocks were split. The tombs also were opened. And many bodies of the saints who had fallen asleep were raised,” writes the holy evangelist. Some artistic renderings of the crucifixion depict the blood of our Lord Jesus Christ moistening the ground and restoring life to the bones of Adam, calling to mind the vision of resurrection given to Ezekiel, when the dry bones revivified, putting on flesh and once more coursing blood, being filled with breath from the spirit of God, and rising from death! 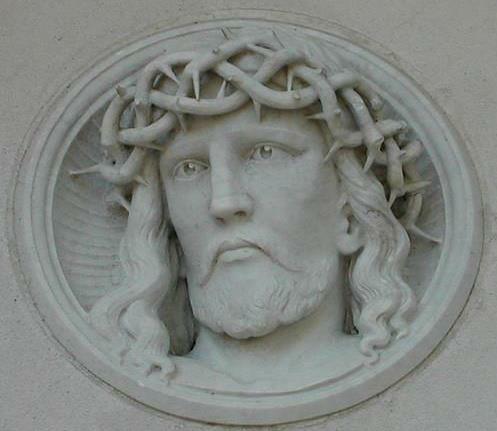 For the Father sacrificed His Son, His only Son, providing Him as a ram, his head caught in the thicket of a crown of thorns, shedding the blood of the Lord who provides. Christianity is a blood religion, for blood is life – the life lost through sin, and life restored through forgiveness and atonement. The blood shed to satisfy the requirements of the Law is Christ’s blood, perfect blood, which cries out to the Father, not for vengeance, but for mercy; not an eye for an eye, but for the forgiveness of sins. 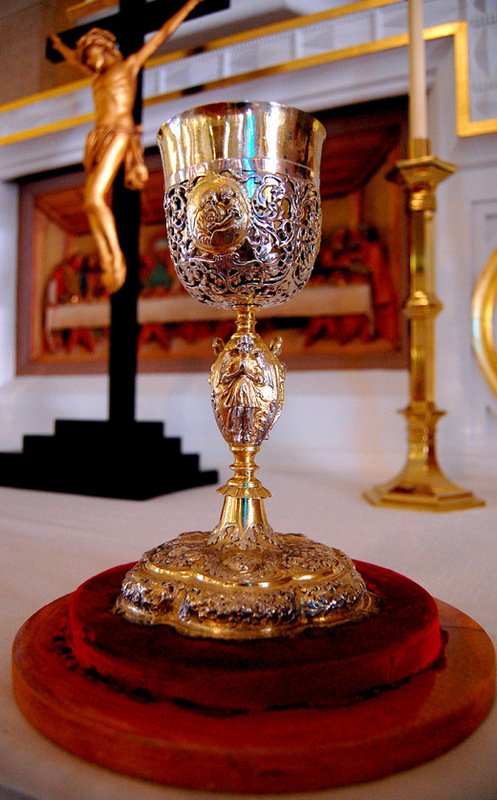 For the blood of the Lord was also mentioned earlier in today’s passion account, dear brothers and sisters: “Drink of it, all of you, for this is My blood of the covenant, which is poured out for many for the forgiveness of sins.” The Lord’s holy blood is not only shed on the cross, it is manifested in the cup by His Word, by His command, by His mercy, by His power. The blood of Christ is given to us to drink, even as His holy body, the flesh of the sacrificial Lamb, is offered to us as bread: the Bread of Life consecrated by His Word, His body, given to us for forgiveness, life, and salvation. For the Lord’s body and blood are sacrificed and poured out on the cross, even as they are eaten and drunk by us: His sinful, but forgiven people! Christianity is a blood religion, because Christ is a flesh and blood Savior! He doesn’t merely wish us well; He dies so that we might live. He doesn’t merely come into our world and carry on like a wise man with wise words; He is Wisdom incarnate, in flesh and blood. He is the Word incarnate, in flesh and blood. And His flesh and blood are given to us in our flesh and blood. And like the depiction of the blood of Christ reviving Adam, like the sacrifice that covered the nakedness and shame of Adam and Eve, and like the children of Israel being covered in the blood of the victim shed by the priest – Jesus is our High Priest and our innocent substitutionary Victim. And His blood does indeed make us innocent, and His blood is on us and on our children, and His blood marks our doors so that the angel of death passes over us! For this is not the blood of bulls and goats, but the blood of God incarnate, God in flesh and blood, the God who has come to save us by means of His blood, the God whose blood is placed upon your lips, the God whose name is on your lips, whose name is Jesus, whose blood has redeemed us, forgiven us, and given to us everlasting life, through the cross and beyond the grave, even unto eternity! Amen. Free Congregations Matter Paper Dolls! 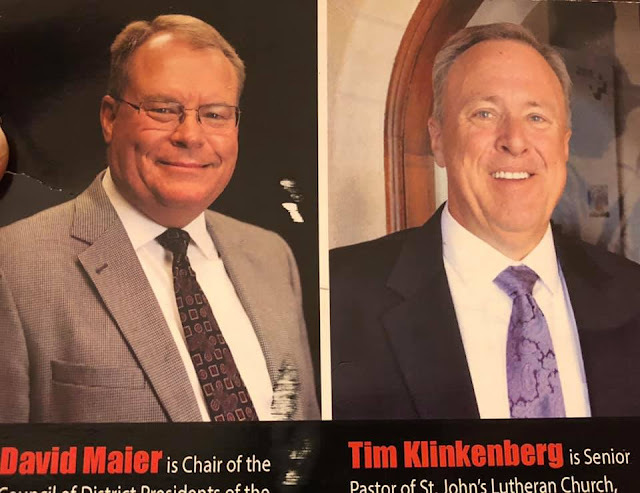 Let’s see what they look like actually dressed up as pastors! Or maybe with great big bishops’ miters! Or rocking a wife-beater with an inked-up gun-show like Nadia Bolz Weber! Or maybe like hipster pastors with the beard, flannel shirt, and knit cap on the head! Let’s put one in a red bandana, and the other in blue, and have a rumble! How about we give them mustaches and banjos? Better yet, I need a Matt Harrison doll and we can do an 8th Commandment Punch and Judy show! Thanks again, CM! Don’t close down that Pak n Ship account just yet (2430 Vanderbilt Beach Rd. “Suite” 412 😂 wink, wink), Naples, Florida 34109)! Dear Vicki, Kathy, Barrie, and Lisa; family and friends, brothers and sisters in Christ, honored guests: peace be with you! The life of a first responder is a reminder of our Lord Jesus Christ: a sanctified life of service to others. And especially the police officer, whose family knows all too well that each day that he goes to work might be the last day that they see him on this side of the grave. He lays down his life for his family, friends, community, and even perfect strangers, and Jesus says that this is the very definition of the word love. In His mercy and wisdom, the Lord granted our brother in Christ Lowell a long life of service to his city, community, and family. And we are grateful to God for his life of service, and we are grateful for this opportunity to reflect upon our Lord who created him, protected him from all harm and danger, and worked through him to serve us in many and various ways – including the holy vocations of father and grandfather. For these too are reflections of the love of God the Father: one who protects us, hears us, shows compassion to us, guides us, and shares in the joys and sorrows of life with us, year in and year out, in love. Jesus said, “I came that they may have life and have it abundantly. I am the good shepherd. The good shepherd lays down his life for the sheep.” For we are indeed like sheep. We go astray. We need to be gathered by our Lord and kept from harm. Our Lord came into our world to protect us from the wolf, that is, the devil, to lead us to lie down in the green pastures of peaceful sleep, to bring us to the life-giving waters of holy baptism, to restore our souls – for we are all sinners in need of forgiveness and mercy. And when we walk through the valley of the shadow of death, He takes away our fears, for He is with us, dear friends. Our Good Shepherd is with us. He saves us. He calls us home according to the will of His loving Father. And He comforts us with His Word and sacraments when we pass through the valleys of suffering, mourning, and death. Our Lord is no hireling. He is the owner of the sheep, and He loves us – just as a father and grandfather loves his family – only where we are imperfect, Jesus is perfect. And when the wolf comes, Jesus does not run away, but He stands and fights for us: He fights for us with every strained breath on the cross. He bleeds for us. He suffers for us. He dies for us. He rises again for us. He gives us everlasting life! We give thanks for the life of the Lord’s servant Lowell, for his life of selfless service and love, for his protection, instruction, and joy – and we give thanks for our Lord Jesus Christ, who created us, redeemed us, comforts us in our grief, shepherds us in good times and bad, forgives our sins, and raises us from the grave to give us life, that we may have it abundantly, a life that has no end. Amen! Our Lord Jesus Christ has just told his listeners that God is not their Father, that they lack understanding, that their father is the devil, that they want to do the devil’s wishes, that they desire murder, and that they are a pack of liars – and that’s just in the first three verses. They did not know Jesus nor love Jesus because they did not know the Word of God – for Jesus is the Word of God made flesh. Jesus is the fulfillment of all of the Word of God ever revealed by the prophets and written into the Scriptures. It is impossible to know Christ without knowing the Word, and one cannot know the Word unless one hears the Word. St. Paul follows this to its logical conclusion, one cannot hear the Word without a preacher, for “faith comes by hearing, and hearing through the Word of Christ.” We need to gather and hear the Word. And that, dear friends, is why Christians are called “the church.” The Greek word for “church” is “the assembly.” Christians gather around the Word of God proclaimed, and the Word given to us in the Holy Sacraments. And that is how we know Jesus. That’s how we have faith. But do we really know Jesus, dear friends? Do we really hear the words of God? Or are we distracted by other things. For if we hear, if we really hear, the Word, it will be the single most important thing in the world. Missing the Divine Service would be grievous to us. And while the Scriptures are being read and proclaimed here in this holy house, nothing could steal away our attention – for in these words are life. Even in this day and age of unbelief, most Americans say they believe in God. Jesus’ listeners said the same thing. Jesus slammed the lid on their pretensions. And that, dear friends, is why the Holy Spirit caused these shocking words of Jesus to be recorded in Scripture and read to you today. You need to hear them too! We need to hear them! For we are in constant need of repentance of our idolatry! We poor miserable sinners allow everything to become more important to us than our Lord, than His Word, than hearing and following Jesus. And this is why our Lord said that “Abraham rejoiced that he would see My day.” For two thousand years before the birth of Jesus, Abraham worshiped Jesus. Abraham trusted in the words of God that even if he were to obediently sacrifice his son, his only son Isaac, according to the Word of God, that Isaac would live. And indeed, the Lord did provide. He provided a substitutionary sacrifice to take the place of his son, a “ram, caught in a thicket by his horns.” This sacrificial male lamb, with his head wrapped in thorns, was a picture of the Christ to come, the fulfillment of the promise “the Lord will provide.” And the Lord provided, and Abraham rejoiced. He rejoiced to see the day of Jesus. He rejoiced to see the fruit of the cross, the salvation of Isaac and of all who believe on His name, who hear the Word of God and keep it. Abraham did indeed “fear, love and trust in God above all things,” for he did not even withhold his son, his only son, from God. How many of us, dear friends, turn our families into idols? How many of us place our children’s wants, their education, their possessions, ahead of their need to hear the Word of God, to participate in the Sacrament of the very flesh of the Lamb of God that takest away the sin of the world? How many of us would obey the Lord’s command to sacrifice our own children, trusting in God’s providence? And how many other distractions do we have that keep us away from the Word? How many other excuses do we give, how many unimportant things to we allow to take precedence over the Word of God? If there is anything in this world more important than that, dear friends, I would like to hear what it is. The world gives lip service to Jesus, or more like, a cartoon parody of the real Jesus. The world wants a tame Jesus, a controlled Jesus who will always affirm them and approve of them and include them ever and always. The world does not want the divine Jesus who is willing to tell them that their father is the devil, that they do not know God, and that they are liars. The world rejects that Word of God: the Word Made Flesh who calls them to repent of their sins and who bids them to take up their cross and follow Him. And the world rejects us for bearing and proclaiming that Word of the cross. Our Lord’s listeners accused Him of having a demon and being a Samaritan. Jesus outright denies their claim that he is demonic. But notice that He doesn’t deny being a Samaritan (which is a racial insult uttered by people who see their own ethnicity as superior). Jesus is not biologically a Samaritan, but He is the Good Samaritan in the parable that He told. For like the Samaritan people, He is hated by most of the Jews who are eager to follow their power-mad leaders: the political high priest and phony king, feckless collaborators with the Romans, men who would not know God even to look at Him right in the face. And unlike the Jewish priest and Levite in the Good Samaritan story, who refuse to help a victim who is battered and bloody, the Good Samaritan who actually lives in the flesh, our Lord Jesus Christ, comes to save. He offers His own blood, sweat, and tears to rescue the one in need: the one who has been beaten up in this fallen world. Jesus has come to rescue us from our sins, from our lukewarmness to His Word, from our idolatry and misplaced priorities. He is calling us back, dear friends, back to the Word, back to the Sacraments, back to “serve the living God,” back to our “promised eternal inheritance” as we gather to hear the Word of God. And let us call to mind that our Lord Jesus Christ is the great “I AM,” God in the flesh, the God who provides, whose flesh was sacrificed for our salvation. Let us thank the eternal and living God that He has withheld nothing from us, not even His Son, His only Son, and that “on the mount of the Lord” it has indeed been provided: the Lamb of God that takest away the sin of the world, His head wrapped in thorns, by whose Word we have forgiveness, life, and salvation. “Whoever is of God hears the words of God!” Amen. In the Garden, before the Fall, there was no scarcity and no hunger. Food was everywhere and was plenteous. Adam and Eve had no concept of hunger, let alone famine and starvation and warfare waged over access to food. It was all perfect. But of course, the serpent convinced them that they had it rough. “Poor, pitiful me,” thought Eve. “Here I am stuck in this dead-end job,” thought Adam. The Serpent marketed to them like an infomercial. He told them that they “could be like God.” He convinced them that God was lording over them, and they didn’t have to take it anymore. We know what actually happened. Everything fell apart. No more would the ground yield its abundance. Now things died. Now seeds refused to germinate. Now, floods and draughts and storms would cause famines. Now, even when there is no flood or draught, we have to labor constantly to keep enough food in our bodies to stay alive. And of course, not everyone has it as well as we do. People around the world suffer horrific poverty and want. It’s our fault, dear friends. We choose our own way over the Lord’s providence. We do not fear, love, and trust in Him above all things. We are the children of Adam and Eve, and we live in the world they left to us. And so it is fitting that our redemption should come as the fulfillment of the Passover: the holy meal of the children of Israel as they were being freed from Pharaoh’s tyranny. The Passover lamb that fed them with his own flesh was a sacrifice, a divine satisfaction for the death that the children of Adam and Eve deserve – the death that will be dealt on those who fear, love, and trust in Pharaoh above all things. The lamb was slain to pay their bloodguilt, and the lamb’s blood marked the people redeemed by God’s mercy. The flesh of the lamb was eaten to sustain the people on their journey, food that was a gift of God’s providence. Of course, this Passover lamb finds its fulfillment in the Lamb of God that takes away the sin of the world! The Lamb who feeds the hungry with the bread of His flesh, given for the life of the world, the sacrifice, the divine satisfaction for the death that the children of Adam and Eve deserve. And in John Chapter Six, our Lord is looking forward to the Passover Feast: a holy meal of bread and wine and the flesh of the lamb. For this is not the Garden of Eden. Food is not everywhere and is not plenteous. Indeed, there is scarcity, and there is hunger. There is not enough money to feed the crowds. Nor does anyone have food enough to go around. Of course, by grace, one does not have to buy the food that Jesus gives, and indeed, even a tiny amount in His hand is enough to feed everyone. 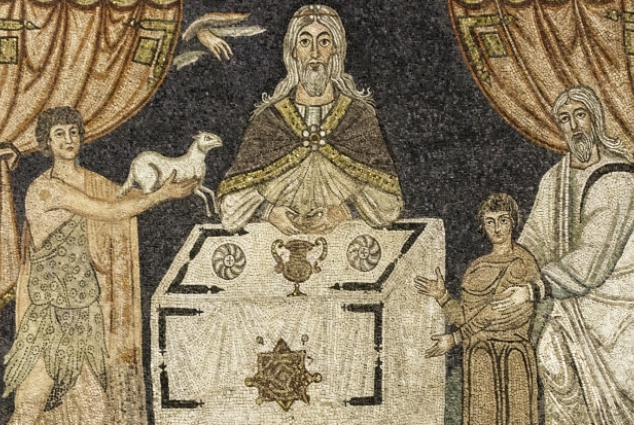 For we are seeing the coming of the New Passover, the multiplication of bread that is the Lamb’s flesh, the abundance of wine that is the Lamb’s blood. The New and Greater Passover will be for all of God’s people who have been freed from the tyranny of Satan. And on this day, as the crowds come to hear Jesus as the Passover draws near, as the multitudes hear the Word of God calling them anew to repent and believe the Good News that their sins are forgiven, that Satan is destroyed, that the old dilapidated world of scarcity is giving way to a restored Paradise without scarcity and want and hunger and death – as they press in to hear the Gospel, Jesus gives them more than just words. “Have the people sit down,” He says. Five thousand men, plus women and children, had come to hear Him preach the Gospel. A thousand men and their families per each one of the barley loaves that a boy had brought. They sat and awaited the blessing of the Passover Lamb, to be fed eternally by the flesh and blood of the Lamb. And in this place, Jesus “took the loaves. And when He had given thanks,” He distributed the miraculous bread to the multitudes. 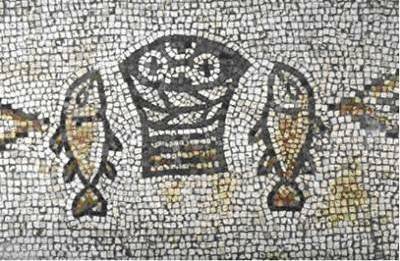 He also multiplied the two fish into a meal for everyone. No scarcity. No anxiety about where the next meal will come from. No lack. No poverty. No hunger. And no death! Not on this day, for Jesus has come bearing the plenteousness of God, the blessing of a miraculous meal that staves off death. Jesus is our Passover, dear friends. Jesus is our manna, dear brothers and sisters. He is the Lamb that takes away our sins, the Lamb whose body was offered as a sacrifice, the Lamb upon whose flesh we feast, the Lamb by whose blood we are saved. Take, eat. Take drink. In eternity, there will be no scarcity and no hunger. Food will be everywhere and will be plenteous. The children of Adam and Eve will have no concept of hunger, let alone famine and starvation and warfare waged over access to food. It will all be perfect. Now the Passover is at hand. Amen. In 1866, a professor and former Episcopal priest (later Methodist minister) named Albert Taylor Bledsoe (1809-1877) wrote a remarkable book that may well have changed American history. The War Between the States had ended a few months before, and Jefferson Davis, the ousted president of the Confederate States of America, was being held as a prisoner of war by the United States government. He was imprisoned at Fortress Monroe in cruel conditions, indicted for treason, and looking forward to a trial and the opportunity to vindicate the Southern states. However, many vengeful northerners waved the bloody shirt and were eager to see Davis hang. The U.S. government, however, had a huge problem: the law was not on their side. Is Davis a Traitor? or Was Secession a Constitutional Right previous to the War of 1861? came out as the country was in a quandary about the fate of President Davis. This work is a scholarly refutation of the "national" theory of the United States, which was a repudiation and misrepresentation of the nature of the American Union according to the Constitution. With grave concerns about the crisis of Davis (and thus the South) possibly being vindicated by a court of law, the federal government opted to release him from prison without a trial. Many credit Bledsoe's book for Davis's liberation. 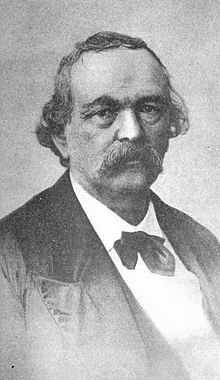 Owing to a loophole, unlike amnesty measures that restored citizenship to former confederate citizens, Davis's U.S. citizenship was not restored during his lifetime. It was, however, reinstated posthumously in 1978 under U.S. President Jimmy Carter. The book is today in the public domain and inexpensive. Many people have asked me for the title of a concise book that presents the Southern side of the secession question. This is a very good example. As a bonus, historian Brion McClanahan of the Abbeville Institute led a five-part study of the book! Dr. McClanahan was the last Ph.D. student of the legendary scholar and professor, Clyde N. Wilson, and is the author of numerous books pertaining to American History. Some people don’t know who Jesus is. It’s our job as the church to tell them. For me, especially as a preacher and teacher, I am specifically called to do this. Some people don’t know who Jesus is because they have never heard of Him. Some have only heard distortions. But there are others who know very well who He is, but refuse to believe that He is God in the flesh, that He came to rescue us from the devil, from the world, and from our own sinful nature. This latter group is hostile to Jesus. And rather than submit to Him, that is, rather than to submit to the Truth, they create an alternate “truth” in their own minds. That is, they cling to a false narrative, one in which good is evil, evil is good, and each individual defines reality for himself. In other words, where anyone can “be like God.” And in this diabolical “did God actually say?” narrative, Jesus is not Lord, not Savior, but is rather some kind of fraud or magician. In this false narrative, Jesus casts out demons by means of demons. In this diabolical story, Jesus is more like the Pharaoh’s magicians who replicate some of the signs of Moses by means of tricks or by summoning dark spiritual forces. To those who don’t believe in Jesus – for whatever reason – but whose minds are open, and whose hearts are held captive to the truth (wherever it may be found), to such people, Jesus is gentle. He tells parables to teach the truth. He quotes Scripture to prove who He is. He teaches in some ways like Socrates. For He is the Divine Logos, the very Logic of the universe that He created. To such people, Jesus is the patient teacher. But to those who know the truth but rebel against it, to those who choose the narrative of the alluring lie over the confession of the inconvenient truth, to those who call good "evil" and who call Jesus the lord of the demons – Jesus is not gentle. He makes no attempt to win them over with parables, but rather condemns them in the language of those same parables. To such people, he quotes Scripture as damnation, and rather than guiding the willing toward the truth, He lays bare the truth that enrage His hostile opponents. In other words, He treats them the same way that He treats the demons: as their master, without mercy, and in such a way as to protect those who are willing to submit to the truth by casting out those who refuse to believe the truth. Why wouldn’t Jesus just be nice? Why can’t He just let people believe whatever they want to believe? Pharaoh wasn’t just innocently ignorant of the true God. Pharaoh was “hard-hearted” that is, willfully stubborn and in rebellion against the Word of God. And so the plagues escalated until finally, death itself would force Pharaoh to release the children of Israel from slavery. But even then, Pharaoh did not repent. Pharaoh sent chariots to attack the unarmed Israelites who were trapped on the beaches of the Red Sea. And in the process of this attack, the finger of God opened the waters, and Pharaoh’s world-class imperial army was wiped out, horse and rider drowned in the sea. Pharaoh’s false narrative of divinity was indeed pointed out by none other than the finger of God. And Jesus is telling His heard-hearted deniers of truth that He is casting out the demons by the very same finger of God that condemned Pharaoh. The hands of Jesus, the hands that were to be pierced by nails at the cross, are the very hands that created the universe, the hands that reach out to us to save us, and are also the hands that will cast the devil and his adherents into the lake of fire. Dear friends, what you think about Jesus matters, and matters eternally. Jesus is not vain Pharaoh or ambitious Caesar. Jesus is not the megalomaniac Napoleon or the madman Hitler. Nor has Jesus come into our world to teach us to be virtuous. You already know the Ten Commandments. Jesus has come into our world to point the finger of God at the demons to cast them into hell, and to use the finger of God to point us to salvation and eternal life – by means of Truth, by means of Himself. And anyone who calls Jesus "evil" is not merely misguided or mistaken, but is rather malicious, doing the work of the evil one, advancing the lie instead of confessing the Truth. Our blessed Lord has no patience for demons and their Pharaohs, past or present. In fact, Jesus has come to cast out the demons from us and to drown our Old Adam and his self-serving “Did God actually say?” narrative in baptismal water, so that a New Man might emerge, the redeemed sinner who looks to where the finger of God points, confesses this as truth, and follows that Truth wherever it may lead – even to the cross. And that truth, dear friends, also leads to eternal life, life as God planned it, before we chose the lie over the Truth, before we sided with the demons who invade us over the angels who minister to us. Our eternal life, dear friends, is a life of paradise, without sin, without suffering, and without death – according to God’s will, by means of His love. The life delivered to us by the finger of God in Jesus Christ, by means of His blood shed upon the cross, delivered through His blessed Word and sacraments – is the life of love about which St. Paul speaks to us again. “Walk in love,” says the Apostle, “as Christ loved us and gave Himself up for us, a fragrant offering and sacrifice to God.” That eternal life, dear friends, is a life of love, of truth, and of conformity to what God created us to be when He fashioned us with His own hands. “Sexual immorality and all impurity or covetousness must not even be named among you, as is proper among saints.” We were not created for “filthiness nor foolish talk, nor crude joking.” We are not to engage in idolatry, sexual immorality, and covetousness. We are not to associate with those who do. We are called to repent, to leave the narrative of the lie and to confess the eternal and saving truth. The reason that hard-hearted people reject Christ is because they reject the life to which Christ calls us, the life by which the finger of God leads us by the Holy Spirit. The hard-hearted enemy of Jesus, of the Church, of the Scriptures, has an agenda of sexual immorality, covetousness, and idolatry – even as Pharaoh expected submission of others to himself, rather than himself to the truth, that is, to God. We are to repent of such things, and by means of our Lord’s cross, we are forgiven of all of them. Jesus has come to cast out the demons and to save those who genuinely seek the truth. And as merciless as He is to the demons, He is merciful and compassionate beyond measure to one who cries out to Him for salvation, for one who is willing to submit to the truth. For even the demons know who Jesus is. Even those most hostile to Christianity, who call good "evil" and evil "good" – know who Jesus is. Let us confess Christ as the God who created us, as the Redeemer who saves us, and as the One who casts out demons and restores us to eternal truth. 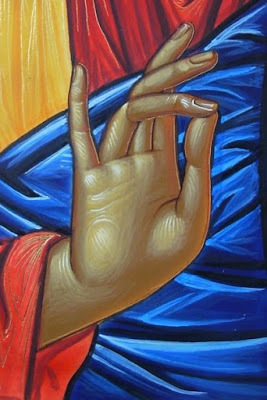 Let us follow where the finger of God points, for it points to our Lord Himself. And indeed: “Blessed are those who hear the Word of God and keep it.” Amen. Years ago, there was a fashion among some Christians to wear bracelets and tee shirts with the letters WWJD. This stood for “What Would Jesus Do?” I don’t think the first thing that comes to mind is that Jesus would ignore a woman who is crying out to Him for mercy, tell her that she is the wrong ethnic group, and then call her a dog. If you think that Jesus is nothing more than a role model about how to be nice, this is not the passage from Scripture that you want to use as a proof text. But here it is. This is the Word of God. This is a revelation of who Jesus is. We realize that our blessed Lord does care about the Canaanite woman, that He does respond to her cry for mercy, but He allows her, and even requires her, to prove her faith. He tests her faith, and then uses it as an example for the disciples. 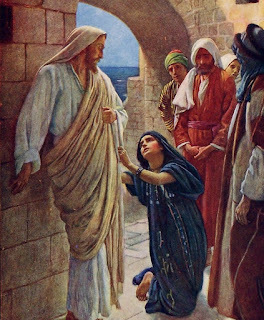 We don’t even know the name of this dear saint whose faith is great, who does not come from the house of Israel, and there are no bracelets or tee shirts that say: "What Would the Canaanite Woman Do?” – but clearly Jesus wants us to imitate her example of persistence in faith and in prayer. In our culture, it is very easy to quit, to walk away. Is your marriage a little difficult? Divorce lawyers advertise their prices on billboards – and they work cheap. The government has made it all so easy with “no fault divorce.” If there ever were an oxymoron, dear brothers and sisters…. Parents can walk out on their children at any time. After all, parenting is hard, and it can get in the way with one’s dreams. Think about how easy it is to walk away from the most important things in your life. If your boss is a jerk, you can quit. If your class is difficult, drop it! Is school itself a lot of work, walk away! Don’t like the music at church, or find the other members annoying, go find one that you like better. We learned a long time ago that it’s easier to throw something away rather than take the time and effort to be part of the solution. But look at the Canaanite woman. Her daughter is “severely oppressed by a demon.” She doesn’t walk away from her daughter. Instead, she fights for her. She is willing to debase herself for her. She is willing to be ignored for her. She is willing to step out of her comfort zone for her. Why? Why doesn’t she just leave? What is behind this mother’s zeal? And look at the Canaanite woman’s confession of Jesus. She is a Canaanite. Who knows what gods or goddesses she was raised to worship? Who knows what religious practices her family was involved in that invited a demon to harass her daughter? But notice that she doesn’t allow her ethnicity and her family’s religious tradition to stand in the way of the truth. Canaanites don’t call Jesus “Lord” or invoke His title as “Son of David.” Canaanites don’t pray to Jesus. One has to wonder what her friends and neighbors and family members thought of this. We aren’t told, but whether or not they approve of her appealing to Jesus for help seems not to matter to her. 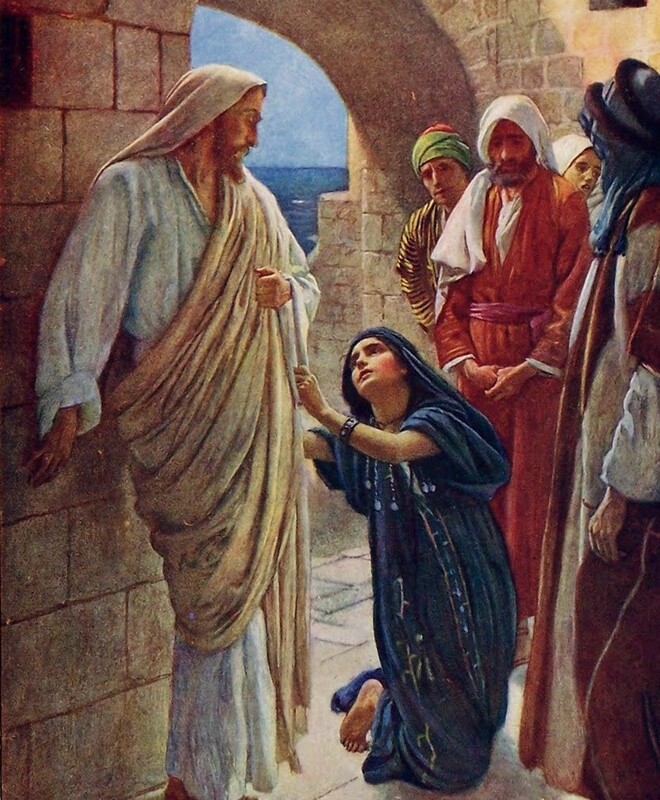 She sets out to find Jesus, and when she has found Him, she continues to pray: “Have mercy on me, O Lord, Son of David,” until He grants her prayer, or denies it. And even when Jesus implies that He is not going to help her because she is unworthy, she doesn’t deny that fact. She doesn’t appeal to equality, or claim that she had been oppressed and marginalized for her ethnicity. She doesn’t start a Twitter hashtag campaign that Jesus is racist or sexist or Canaanitophobic. She owns up to the reality of who she is: a poor, miserable sinner, one who is not worthy to sit at the table of the children of God. And yet, she still doesn’t quit. She holds Jesus to His Word. Our Lord indeed came to redeem the children of Israel, but He also came to redeem the world. The Canaanite woman has faith in Jesus Christ, the Lord, the Son of David, and she demonstrates that faith in her persistence in prayer. So why does Jesus allow her to continue for so long? Why doesn’t Jesus grant her prayer right away? We don’t know for sure, but we do know that her persistent faith is praised by our Lord and is recorded in the Gospel. Clearly, the Lord wants us to learn from her example. The kingdom of God is not like the world. In the world, if you get annoyed with Walmart, you can go to Rouses. If you grow weary of the Big Mac, you can go up the road and buy a Whopper. On your way, you can take a picture of the divorce lawyer’s ad. You can move out of the house and leave your children in someone else’s care. You can quit your job and pursue your dreams. You can enroll in school, and then quit that too. If your team is losing, you can pick a new one. Something’s broken? Throw it in the garbage. You can do that with people too. The Canaanite woman likewise came to believe and to know that Jesus is the Lord, the Son of David, and there was nowhere else to go. Jesus is the Lord. Jesus has dominion over demons. Jesus has mercy. Jesus has the power and authority to heal her daughter. Jesus will hear her prayer. And this is the great faith of the Canaanite woman. Her faith is unmoved and not discouraged by those around her. She is not swayed by hurt feelings or anger or pride. She is unaffected by her family’s religious identity. Her love for her daughter and her single-minded pursuit of Jesus in prayer is a clear indicator of the faith of the Canaanite woman. While it’s not a bad idea to ask oneself “What Would Jesus Do?” when faced by an ethical dilemma, maybe it’s more helpful to turn to Jesus with the persistent prayer: “Have mercy on me, O Lord, Son of David,” and seek His healing and mastery over the demons. Maybe we should approach Him as one unworthy of His blessings, humbly, without a sense of entitlement, and still persistently imploring God to hear us and to be merciful, because He is the Lord, the Son of David. May our faith be like the Canaanite woman, who persists in prayer, and who doesn’t walk away from the vocations to which she is called. Let us pray for the kind of faith that doesn’t quit, knowing that Jesus is indeed merciful. He is the Lord. He hears our prayer. Thanks be to God. Amen. My appearances on Issues, Etc.